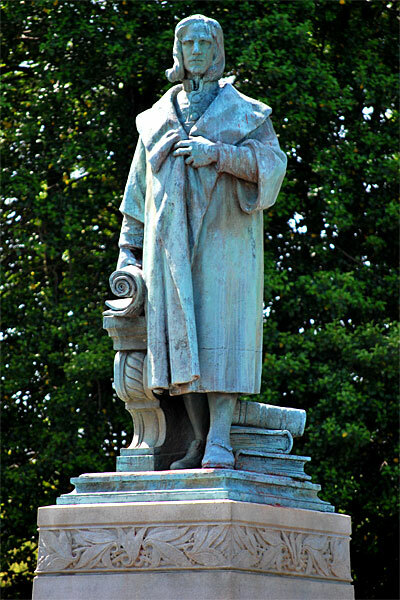 WHAT: “Fitzhugh Lee” monument in Monroe Park in downtown Richmond, Virginia. 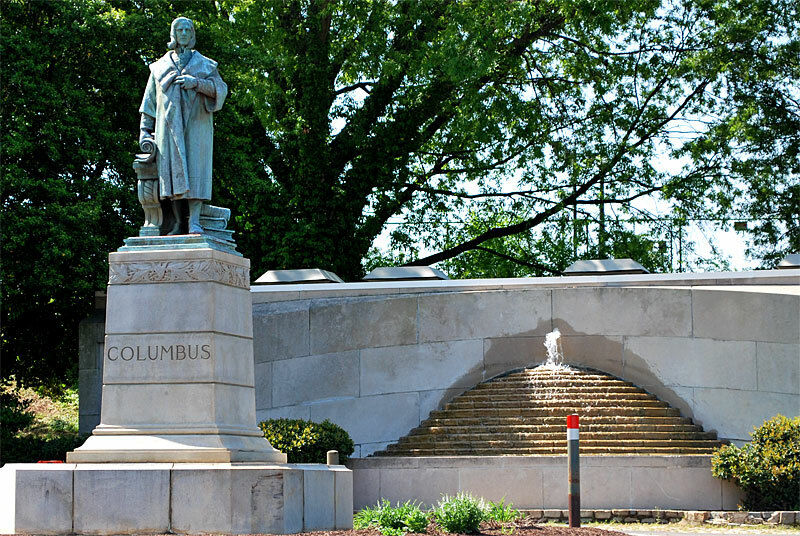 LOCATION: Monroe Park is bordered by Franklin, Belvidere, Main and Laurel streets in the Fan District. 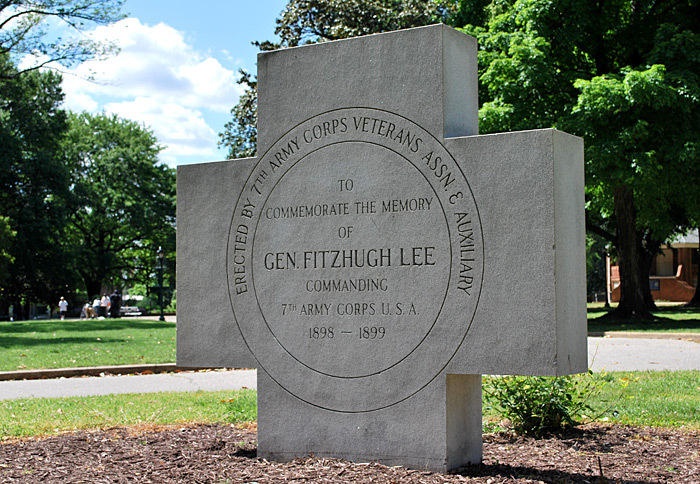 DESCRIPTION: A white stone cross 6-foot high memorializing General Fitzhugh Lee’s efforts as a Commander of the 7th Army Corps USA 1898-1899. Erected by the 7th Army Corps Veterans Association and Auxiliary. 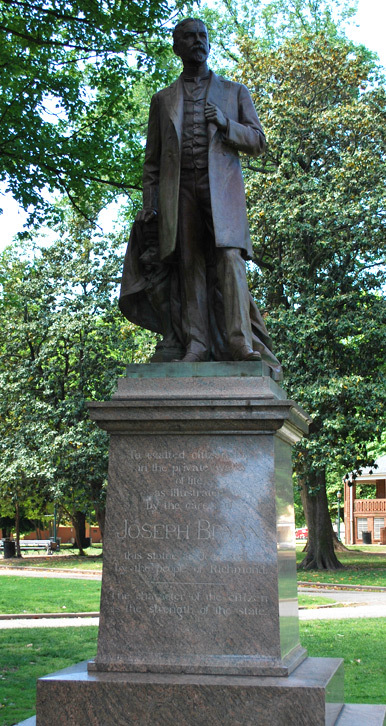 WHAT: “Joseph Bryan” monument in Monroe Park in downtown Richmond, Virginia. DESCRIPTION: A bronze standing figure 7 1/2 foot high on a granite base 8 1/2 foot high of Joseph Bryan, a brilliant Richmond businessman and civic leader who distinguished himself during the Civil War as one of “Mosby’s Men” and was known for his generous philanthropy. 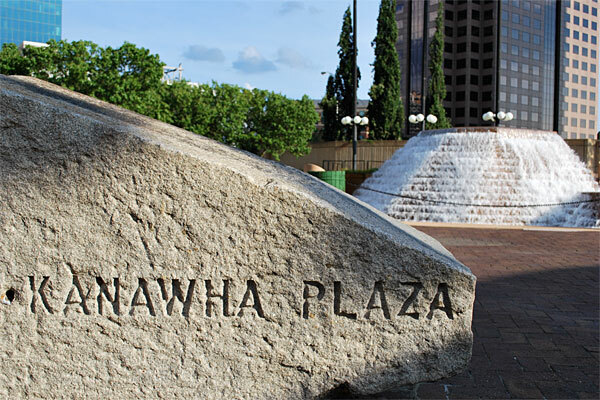 Kanawha Plaza is at Byrd and 9th streets, just north of the Federal Reserve Building. The park is surrounded by downtown Richmond’s most influential and important employers: The Fed, Dominion Virginia, banks, law offices, stock brokers — you name it. The park sits above the Downtown Expressway and covers an entire city block. It has a concert stage and grassy lawn that is primarily used for Fridays at Sunset jazz and R&B concerts and occasional festivals. The stage also provides shelter for many homeless that need a break from the sun during the day. Many homeless sleep on benches in Kanawha Plaza as well. 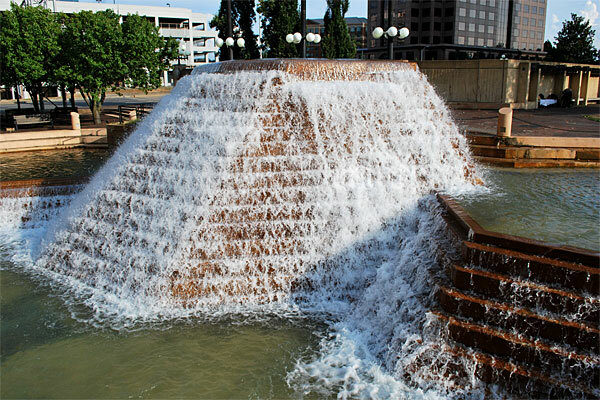 The best feature of the park is the cascading fountain, which at the right time of day can look quite impressive among the tall buildings and busy streets. Unfortunately, I’ve also witnessed the waters of the fountain double as a laundromat for the park’s homeless, and I can only assume that the next step would be bathtime. Not an attractive thought. Don’t get me wrong. Homeless people getting “cleaned up” is an improvement. I’m sure it’s common in most big cities. Probably encouraged in Europe. I’ve seen plenty of examples along the James of what I assume are homeless bathing in the river. I’m just not sure I want to happen by the park with out-of-towners enamored with a lovely fountain, only to witness laundry day. Finished in 1800, the Great Basin was the eastern terminus of the Canal. It was a block wide and three blocks long and was located between Cary and Canal, and 8th and 12th Streets. The Basin was up to 50 feet deep and was probably made by damming a stream valley at its east end (12th Street). Warehouses and trading firms surrounded the Basin and the docks along its stone walls were active. In addition to allowing the long, narrow canalboats to turn around for the trip back up the Canal, the Basin supplied water to various mills around its edge. Railroad yards covered half the Basin in the 1880’s. By the 1920s the Basin had been completely covered over. Construction excavation on the site for the James center in 1983-86 yielded the hulls of batteaux, canalboats, and other artifacts of the canal era, some of which have been saved. NOTE: I chose not to publish my photos of the homeless. I’m not trying to get anyone arrested or start trouble. Just a little disappointed in humanity. 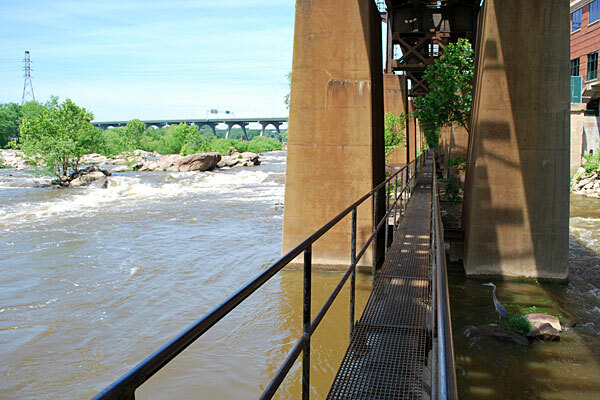 I love the James River and spend a lot of my free time kayaking, swimming, biking and hiking wherever I can in Richmond. I am also dedicated to several volunteer groups that help clean, maintain and restore some of the river’s best features. Many people in those groups have a good sense of the best ways we can improve the way we utilize the river and its resources — and ways to make those visions a reality. 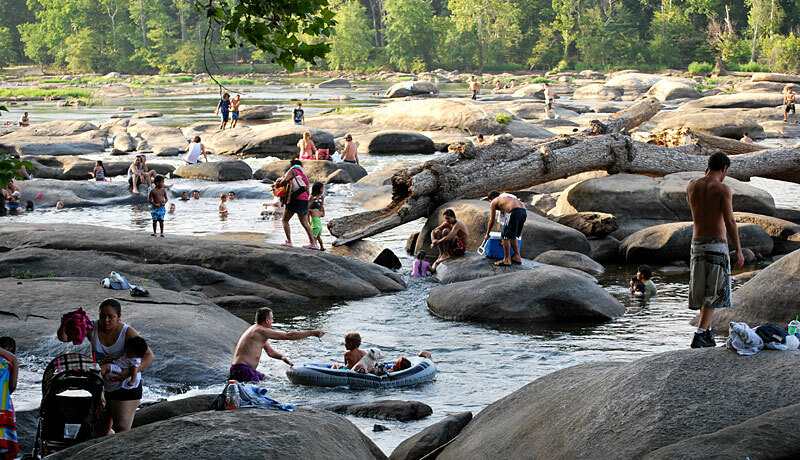 The James River Park System is now protected by a conservation easement that limits development, but that doesn’t stop us from developing new ways to enjoy ourselves when we visit. Richmond.com published Part I of a Top 10 Wish List of the things I’d love to see happen in our treasured park system. 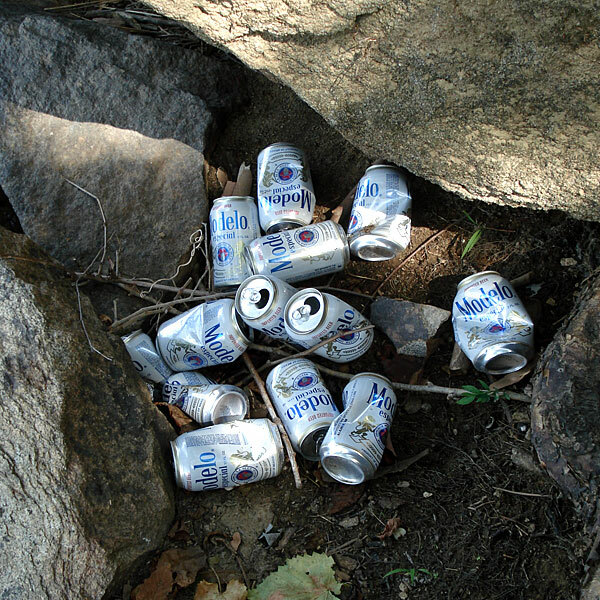 The Forest Hill Yacht Club can defend its own turf. The first ever Regatta at Forest Hill Park Lake back on May 22 must have impressed someone important because non-motorized watercraft are permitted in three lakes in parks in the City of Richmond as of July 1. The City of Richmond Department of Parks, Recreation and Community Facilities posted signs Thursday at Byrd Park’s Swan and Shield’s lakes north of the James River and at Forest Hill Park Lake on the southside in Westover Hills. That’s good news for paddlers. Fishing is possible at all three lakes and they are all big enough to have space to play, but small enough to stay safe. A great family friendly choice by the forward-thinking staff led by director J.R. Pope. The use of non-powered watercraft provides park boaters the opportunity to view the beauty of city’s parks from a different perspective. Paddling and rowing are activities that require the engagement of multiple muscle groups and which helps tone muscles and reduce body weight. That fits my perspective on why I bought a kayak in the first place — to see things on the river from a different perspective. It’s also a big reason why I’d love to see people allowed into the Haxall Canal. 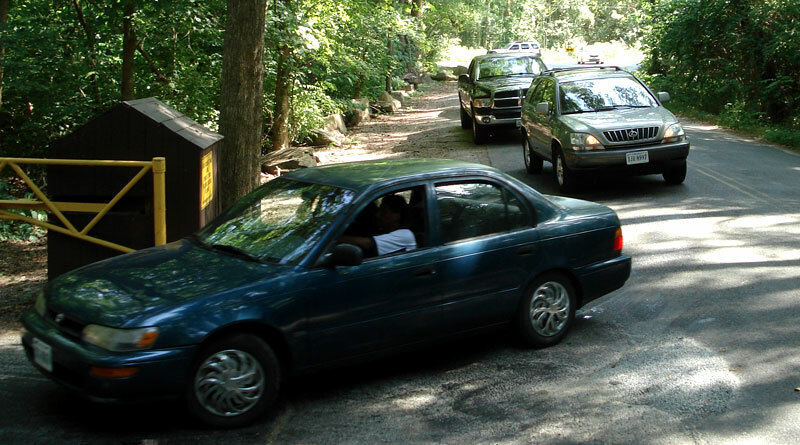 You could become part of the scene and add to the atmosphere at a park or event. At this time, there is no advancement on being permitted to paddle in the Haxall Canal at Brown’s Island or offering paddle boats for rent during events like Friday Cheers or the Richmond Folk Festival, but we’ll keep working on that one.